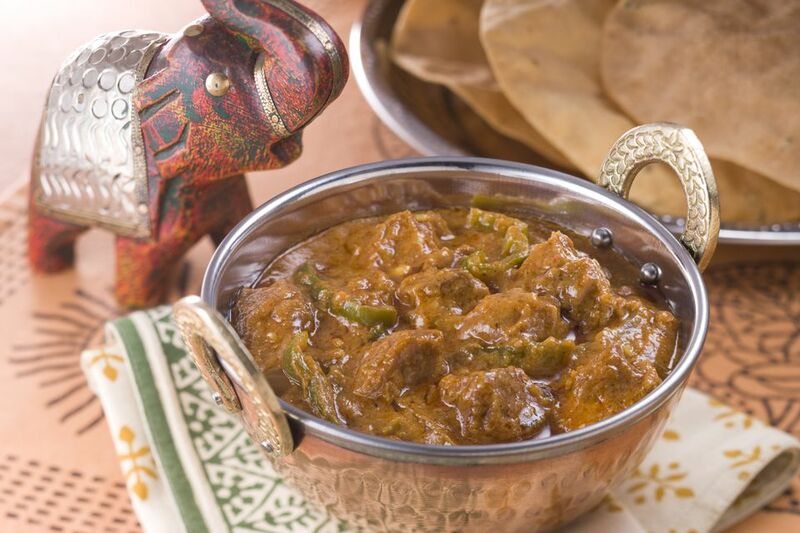 Masala Gosht is simple yet delicious dish packed with flavor. "Gosht" in Hindi means "meat," and "masala" is "seasoning," so the dish translates literally as "seasoned meat." You can choose the kind of meat you'd like to use for the dish. If you don't want to use mutton or goat meat, you can make it with beef and it will be just as tasty. This is an easy dish to throw together, but the trick to getting it right is to ensure that the meat is tender when done. This recipe involves two steps: marinating the meat and preparing the gravy. The marination process is brief, so most of the time is taken up by how long it takes you to make the gravy. Masala Gosht goes well with hot, freshly made chapatis—Indian flatbread—as well as plain or Jeera rice. Add a crunchy salad like kachumber for a well-rounded meal! Put the marinade ingredients into a blender and grind them until you get a smooth paste. Put the mutton, goat meat, or beef into a large non metallic bowl and pour the marinade over the meat. Mix to coat the meat well. Place plastic wrap tightly over the bowl and set it in the refrigerator to marinate while you make the gravy. Heat the cooking oil in a heavy-bottomed pan on medium heat. When the cooking oil is hot, add the chopped onions. Sauté until the onions begin to turn a pale, golden brown. Add the garlic and ginger pastes and sauté the mixture for one minute. Add the tomato paste, the powdered spices, and salt to taste. Mix well. Sauté the resulting masala—the onion-tomato-spice mixture—until the oil begins to separate from it (about 10 minutes). When the masala begins to look ready, turn off the heat. Put the prepared masala into a blender and grind it into a smooth paste in a food processor. Note: Do not add water when blending. Once done, remove the paste and place it in a separate container. Turn the burner on medium again under the pan that you used previously to fry the masala. When the pan is very hot, add the meat and marinade and sauté until the meat begins to turn opaque. Add the masala that you prepared previously and 1/4 cup of boiling water. Stir well. Cook until the meat is tender and turn off the heat. Keep checking as the meat cooks. Add a little water if needed. The end result should be a dish with thick, minimal gravy. If liquid remains in the pan when the meat is cooked, cook for a few more minutes, checking frequently. Garnish the dish with chopped coriander and serve with chapatis, plain or Jeera rice, and kachumber salad.